The cold weather is coming soon, and it’s time to pull out the heavy clothes, make sure the heater’s ready to go, and check to be sure the windows close tightly. If you live in a climate like ours, in Toronto, you’ll surely be checking to make sure your snow shovels are in good shape and that you have a supply of de-icer, too. In the midst of it all, you’re also going to want to make sure your patio, sidewalks, and driveway are ready for the season. So let’s have a look at some steps for caring for your outdoor stamped concrete surfaces before and during the winter! 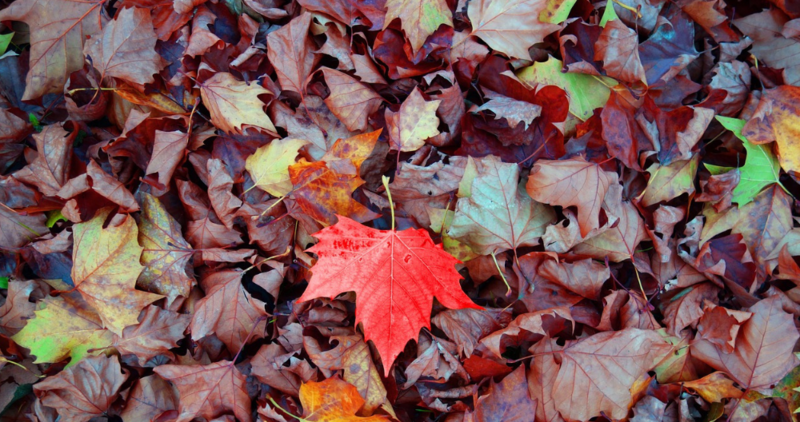 Fall presents its own challenges for yard work throughout most of the USA and Canada. As the weather turns colder, the leaves begin to fall. It’s time for a lot of cleanup and care. Taking the right steps now will also make everything go more smoothly once winter hits. The most important step can also be the most annoying: keeping dead leaves from piling up on your surface. It can seem like there’s a never-ending supply coming down from the trees, and you might have to clean them up several times during the season. It’s important to be sure that piles of leaves don’t sit for too long. Get them bagged and disposed of. We don’t mean you have to sweep and rake on a daily basis, of course. But when leaves sit, they can trap moisture. Over time, that can stain the surface of your concrete. Also, if left over the winter, that same moisture can freeze and thaw multiple times, doing even more damage if it penetrates the sealant on your concrete. This can lead to flaking of the surface or perhaps even larger cracks. Likewise, don’t store anything on the patio that can trap moisture in other ways. Tarps or other covers can lead to the same kind of issue. Using a broom or a plastic rake on your driveway or patio is fine. Avoid using a metal rake, though, because this can damage the sealant as well. And speaking of damage to the sealant – how long has it been since you’ve had the surface resealed? This should be done at least every two years, but be sure to pay attention in case it needs it every year. The fall is a good time to look at it closely and have it resealed if it needs attention. It’s always best to have a professional reseal the surface, but if you’ve switched contractors or you decide to do it yourself, be sure to use the recommended type of sealant. There are a variety of products available, and their different chemical makeups may do more harm than good. Once the real cold weather hits, there are other important things to remember to care for your stamped concrete. But really all it takes is being attentive to the situation and not falling into carelessness. The “special care” just has to do with when it snows or ices over. Other than that, simply keep in mind the same need for keeping leaves, trash or anything that can trap moisture from accumulating. When it does snow, remove the snow as quickly as possible. Don’t use metal snow shovels though. Also, be extremely careful with plowing. Plows can chip the sealant and allow moisture to get inside the cement itself. Remember to remove the snow not only from the obvious areas like your walkway and driveway. Try to get it off the patio or other less-used areas as well. When you need to use de-icer, never use rock salt. It can eat away the sealant quickly. And not only does it harm the sealant, but it hurts the cement as well. 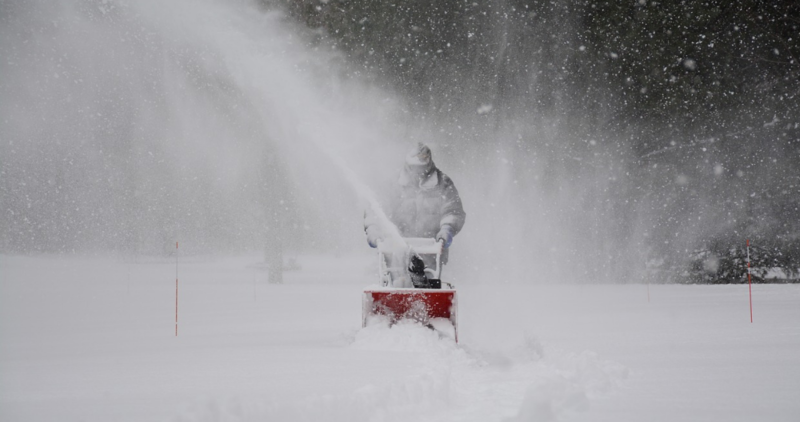 Even with other deicing agents, use only the minimal amount needed to allow you to shovel off the slush. Try to remove any residual de-icer as quickly as possible; it might be easier to do this with a broom rather than a snow shovel. Your best bet is to check with your contractor to see what kind of de-icing projects they recommend for your surface. The wrong kinds can lead to discoloration or other damage. If it’s the first year since your surface was installed, try to avoid de-icers completely. Until that second go-round of the seasons and another application of sealant, it’s much more likely that the surface will be damaged. There’s still always a risk of ice reforming or areas you can’t easily get to, like under your car. If you’re worried about slipping or your tires are spinning, use sand to create traction. It’s perfectly safe for your concrete as well as being effective. Caring for your stamped concrete surfaces in the fall and winter really isn’t any tougher than caring for any other surface. But if you’re still worried about the damage ice and snow can do, you might consider a heated driveway or patio. Not only will it help avoid the damage that could be done through chemical products, but it’ll also save you lots of backbreaking shoveling! You’ve put a lot of your hard-earned money into making your outdoor areas beautiful. A little caution during fall and winter can help them stay that way. By treating your stamped concrete driveway, walkway and patio right, you’ll help guarantee that you can enjoy it for years to come!